Gould Design Inc. has been selected as the 2013 Best Construction Blog, though the combination of judged and popular vote resulted in such a close race that Sage Construction and Real Estate, which came second, and third-place Georgia Construction, Lein and Law Blog (Cobb Law Group) could have easily switched places, or been overtaken by fourth-place Your Restoration Coach (Dan Murray) or fifth-place PJHM Architects with just a minor variation in the judges’ evaluation or criteria. In other words, this years’ competition resulted in an extremely close finish. 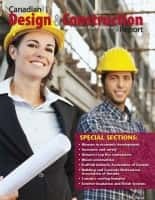 I asked the three judges, freelance writer Heather Kirk, marketing consultant Mike Jeffries, and the Construction Marketing Association (Neil Brown) to rank the blogs taking into consideration design and content quality. Then I added popular vote, giving the highest score to the highest popular vote. The judges voted independently without consulting each other. Maybe the results would have been different if they sat together and discussed their opinions. Gould Design Inc. provides “design solutions to component manufacturers with unique requirements, while maintaining quality and timely performance, optimally suited to your individual needs.” President Chris Gould personalizes his blog with down-to-earth observations on a diversity of topics. 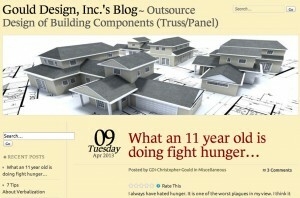 Here is my review of the Gould Design Inc. blog. Georgia Construction Lien and Law blog (Cobb Law Group) is the only blog to to be selected by all three judges — including one who thought the blog to be the best. This blog would have scored better with a higher popular vote. Finally, one judge considered PJHM Architects as a solid favorite, but Dan Murray’s Your Restoration Coach received one (tied) second and one third place vote from the other judges — and the higher popular vote put this video-focused blog into fourth spot. I plan to interview the five finalists within the next few weeks to learn more about their blogging methodologies, perspectives and goals. Of course, all of the bloggers really won by entering the competition. Each received a positive review and evaluation, helpful for search engine rankings and all will continue to be listed in this blog’s directory. Nominations for the 2014 competition will open in December. 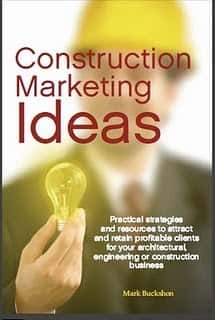 In the meantime, if you have a blog you would like to be included in our directory (no charge) please email buckshon@constructionmarketingideas.com. Congratulations to the finalists. Thanks, as well, to everyone who voted and the judges. Buyer personas — Are they useful?